You can fit the whole family into this compact 6 berth 2008 Bailey Ranger! It weighs in at only 1,080kgs meaning it can be towed with a medium-sized car. It's all set-up and ready to go! Treat yourselves and the kids to some quality family time. Alko over-run brakes. No electric brakes required. The caravan has a 12 pin plug however I have a converter to a 7 pin flat and small round available for hire. THIS IS A EUROPEAN CARAVAN AND IS SUITABLE FOR SEALED ROADS ONLY. PLEASE CALL ME ON 041 2020 434 IF YOU HAVE ANY QUESTIONS REGARDING BOOKING. This 6 berth has two singles/double bed in the front seating area, fixed bunks at the rear and a two-seater dinette that converts to another two bunks. It has a brand new air-conditioning unit to keep you cool and a motor mover for easy manoeuvring. The 250w solar panel is perfect for non-powered sites and you can keep track of the battery with the Victron monitor. The kitchen has a gas oven, grill and 4 burner hob and comes equipped with kitchen basics such as jug, toaster, frying pan, pots and steamer, cutlery, plates, cups, mugs, wine glasses etc and pantry staples (tea, coffee, sugar, salt, pepper, oil). The bathroom is small but functional with a Thetford swivel cassette toilet and a shower. A 40 litre aquaroll and wastemaster is available if required and a 50mm towball and plate will also be supplied when towing the caravan. The caravan MUST be returned in a clean condition inside and out, or a $100 cleaning fee will be charged. The toilet must be emptied or a further $100 fee will be charged. An inventory checklist will be completed before and after hireage. Please allow at least one hour for a full handover before you take the caravan on your journey. Owner relocation and set-up at a place of your choice is only available by prior arrangement and at owners discretion and time permitting. Cost is $2 per km and $50 for awning set up. Pickup is from Parkwood, Northern Gold Coast. 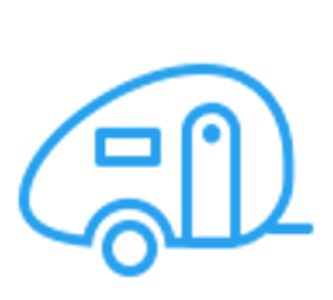 Pick-up is from 2pm and the caravan must be returned by 11am unless by prior arrangement. If returned late an extra days rental may be charged. Cleaning the inside and outside at my property is possible, please ask. CARAVAN MUST NOT BE TAKEN OFF-ROAD. FOR SEALED ROADS ONLY. MUST BE OVER 25 YEARS OF AGE TO HIRE. Must be cleaned inside and out, and have toilet emptied before returning. Super light easy to van to tow, has all the amenities one could need and was in immaculate condition. The air conditioning was amazing! Annie was easy and quick to reply and very accommodating. Would definitely hire this van again! Thanks Annie your caravan was just perfect. Such an easy setup and pack up, clean and modern and hiring from you was a real pleasure. By the way a lot of positive comments from other campers at the park. Ive already passed your details onto some camping mates and family...and well be back soon. Annie was a fantastic hirer. The caravan was impeccably clean, modern and comfortable. Annie delivered on time and picked up on time. Above and beyond all expectations. I would definitely recommend Annie and the Bailey Ranger van if you want great value accommodation. If you're looking at hiring a caravan then Annie is the lady to see! Shes always there to help and make sure you have the best stay possible! The weight was not even noticeable. Fantastic van and absolutely wonderful owners. Awesome van in as new condition. Annie was great. Always answered if I had any queries about the van while I was away and explained everything really well when I picked it up as this was my first time using a caravan Highly recommended. I'm a busy mum of three young girls and in my spare time I run a business importing used caravans from the UK. www.caravanimportsgoldcoast.com.au Ask me if you'd like to try before you buy!